Add all of the beans into a large bowl. Dice up the red onion chop. Then cut celery stalks into small pieces. Cut the red pepper into small pieces. Add all the ingredients into the large bowl with the beans. Add the cherry tomatoes into the bowl as well. When finished mixing, add the 9 Bean Salad Dressing Mix to the bean mix. Double dressing if needed. 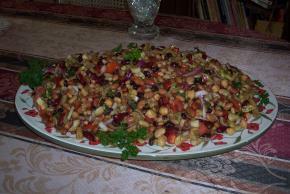 Pour bean salad into an air sealed container and refrigerate for at least 4 hours over night. The longer it rest the better it will taste.